A camera captures the second stage of solar sail deployment on the Japanese Ikaros mission. 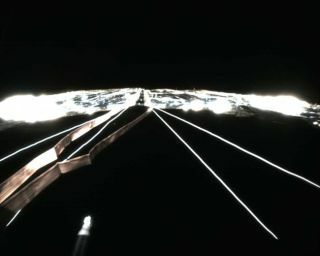 Four thin tethers that mechanically connect the solar sail membrane with the main body can be seen extending downward on both left and right sides of the image, while a harness that provides the electrical connection extends from the center to the lower left. Japan's new solar sail spacecraft has fully deployed itssail and begun generating power through its embedded solar cells, according toJapanese officials. The solarsail, named Ikaros (Interplanetary Kite-craft Accelerated by Radiation Ofthe Sun), aims to become the first successful space mission propelledsolely by sunlight. But first the Japan Aerospace Exploration Agency (JAXA)must begin testing the navigational systems that will guide Ikaros toward Venusand beyond. "We will measure and observe the power generationstatus of the thin film solar cells, accelerate the satellite by photonpressure, and verify the orbit control through that acceleration," JAXAofficials said in a statement Friday. Ikaros reached orbit last month by piggybacking on thelaunch of a larger JAXA mission, the Venusclimate orbiter called Akatsuki ("Dawn" in Japanese). Bothspacecraft launched along with four small satellites on May 20 (early morninglocal Japan time on May 21), from the Tanegashima Space Center on Tanegashimaisland in Japan. Deployment of the solar sail began on June 3, as thecircular disc-like package spun up to about 25 revolutions per minute andallowed four weighted tips to begin dragging the folded solar sail outward toform the shape of a cross. Once that first stage had completed, the solar sailmembrane was released to fill out its kite shape. The 700-pound (315 kg) Ikaros is designed to use only thepressure of sunlight as propulsion during its journey. But it also has thinfilm solar cells built within its kite-like frame that can generateelectricity. JAXA hopes that the demonstration could eventually lead tofuture spacecraft which combine solar sailing with electricity forion-propulsion engines — not unlike a sailing boat that also uses asolar-powered engine. The mission also has the goal of demonstrating navigationalguidance and control for solar sails. An earlier Japanese solar sail missionmerely deployed from a sounding rocket in 2004, but did not attempt controlledflight. Past U.S. solar sail attempts faltered before ever reachingorbit because of a Russian rocket malfunction and the third failed flight ofSpaceX's Falcon 1 rocket. A British space mission the size of a shoebox couldalso demonstrate solar sail propulsion sometime next year. That mission, calledCubeSail, will aim to use sails as brakes to takedown failing satellites. Ikaros will take the same starting trajectory as the AkatsukiVenus climate orbiter, but it won't make a pit stop at the shroudedplanet. Instead, the Japanese solar sail is scheduled to pass through theorbit of Venus and continue on a long, three-year journey to the other side ofthe sun.